Students work on the driving skills needed to obtain their Class A license. 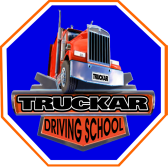 After successful completion students will be able to operate a Tractor-Trailer. Program consists of classroom and on the road practice to ensure the best possible learning experience. DOT Medical Certification information is available upon request. Upon completion of training student will receive a certificate of completion. Age Limits: To drive Class A commercial vehicle the minimum age is 21. We offer training in Manual Transmissions. All Lessons Must Be Scheduled and/or Canceled 24 Hours in Advance. Prices and Packages are subject to change without notice.